New Zealand and Australia don’t have that many interesting culinary traditions. Pavlova is a famous dessert originating from the region, but being meringue-based it is difficult (although not impossible) to veganize. Still, I might be tempted to to try it in the future. I’d have liked to try something from Maori cuisine, but couldn’t find anything intriguing that would have be easy to cook in a normal kitchen and would make sense to veganize. Kumara or sweet potato is a popular ingredient, but I haven’t seen any particular recipes for it. There are two types of cookies – or biscuits, as they’re called there – popular in New Zealand (and Australia), ANZAC bicuits and Afghan biscuits. I’d have gone for the slightly more interesting Afghan biscuits, which feature a chocolate icing. Sadly they also include corn flakes and as no one in my or my boyfriend’s family eats them, I couldn’t justify buying an entire box just for cookies. So, vegan ANZAC biscuits it was. They have got their name from the Australian and New Zealand Army Corps, as family members sent these biscuits to their loved ones serving abroad, because they keep very well. I used this recipe which was easy enough to veganize: I only needed to replace butter with margarine. We have excellent vegan margarine in Finland, great taste, no hydrogenated fats (let alone trans fats) and very inexpensive. I also made another substitution, using very light beet molasses instead of the called for golden syrup (sugar beet is grown here in Finland, so pretty much all sugar and syrup is made of beet sugar). Even before I started I was worried the amount of fat/liquid in the recipe was too little, but I went with the instructions. However, I could not form the result into a dough, not even a very crumbly dough; it simply did not hold together at all. So I had to add more fat and more water than called for. I also added a little vanilla and cinnamon even though they were not a part of the recipe, as well as salt, which should be added to all cookies. The resulting cookies did not spread as in the picture (some reviewers mentioned having the same problem). They were only slightly chewy when fresh and completely crispy, even a bit hard when cooled. While I prefer chewy cookies, I still liked them a lot and will likely make them again. The coconut flavour is not discernible, which was good as I don’t like coconut that much. I have a feeling these cookies could be made gluten-free for those who can eat oats by using a gluten-free flour. Mix the flour, oats, sugar and coconut together. Melt the margarine and stir in the syrup, water and the baking soda. Add the liquid mixture into the dry ingredients and mix well. Form into about 24 balls and flatten them into cookies. Bake at 175C/350F for 15 minutes. This entry was written on March 16th, 2010 by Maija Haavisto and filed under Baked goods, Desserts and sweets, Oceania. 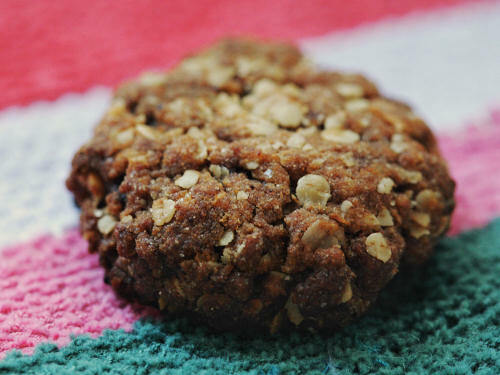 I love Anzac biscuits! A traditional aussie dessert that I really want to try veganising is the Lamington. They were invented in Queensland, and it is basically a plain sponge cake, cut into squares, iced with chocolate and dipped in coconut. My partner’s grandmother makes them every christmas! I didnt know Afghans were from my part of the world, I made them at school once, and were the yummiest thing Id eaten, and only in the past few weeks, have been thinking I must veganise them. And, yes, Anzac are a brilliant biscuit for vegans.